In 2018, Samford University is taking on another significant construction project to help move forward the implementation of the campus master plan. The food court in Beeson University Center will be redesigned in 2018. Because Samford officials wanted student involvement, they engaged interior architecture students to create possible plans and 3-D concept sketches. These 22 students, comprised of juniors and seniors, met with officials from Samford Dining, toured facilities, learned the needs of individual vendors and distributed surveys to the student body. By the end of the fall 2017 semester, each interior architecture student created his or her own proposal and presented it to the Samford administration, including President Andrew Westmoreland, Executive Vice President Harry B. Brock III and Associate Vice President for Operations and Campus Initiatives Kimberly S. Brown, as well as representatives from Davis Architects. From there, the firm will evaluate which one(s) best meet the needs of the university. The interior architecture students are considering more than just the food court proper. They are looking at accessibility, Harry’s Coffeehouse and Starbucks to see how to incorporate these aspects into the whole project. “We are truly excited that the administration gave our students this opportunity,” Jeannie Krumdieck, professor in the department of interior architecture, said. She is hopeful the architecture firm will invite students to view the final solution and presentation once it is completed on the firm’s end. 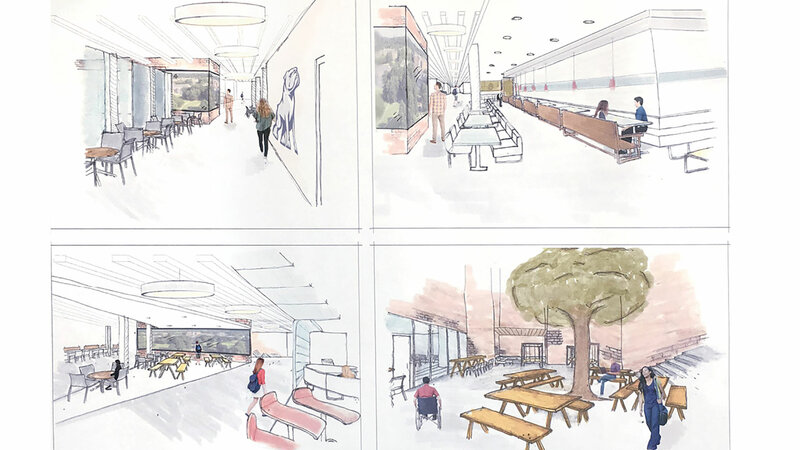 The student body has had ample opportunity to be involved in the redesign of the food court, with opportunities such as a suggestion box and a comment box. “We’re expecting the food court to be easier and more accessible from entrances and more appealing to spend time in,” Wade Walker, director of business services, said. The projected 2018 timeline is to develop the final architectural plan by the spring, construct the new food court in the summer and have the renovated food court ready by the fall semester. The design renderings can be found on the Renovation home page. Maryellen Newton is a journalism and mass communication major and a news and feature writer in the Division of Marketing and Communication.